At Red Sun Farms we are proud of our greenhouse vegetables. But what is the difference between our greenhouse grown produce and other traditional growing methods. Today we are here to answer some of these questions and give some insight to the benefits of greenhouse grown. One of the biggest benefits of high tech greenhouse produce, is the ability to supply fresh delicious produce, all year long. This is due to our produce being grown in a controlled high-tech environment. Because of that, we are not as reliant on the climate outside like traditional growing methods. Being greenhouse grown also allows for a greater consistency across crops, and a uniform flavor and shape. At Red Sun Farms we try to minimize our waste wherever possible. Our tomato production use up to five times less water than what is required for field production. 75%-85% of that water is rainwater that is gathered from the roofs of our greenhouse. Whatever water that is not used by the plant is sterilized, reconditioned and recycled back into the greenhouse; This is huge when you consider that each plant consumes 1L – 2L of water per day and up to 3L of water in the heat of the summer. Our high-tech greenhouses are home to a plant density of over 10,000 plants per acre; that’s over 960lbs of tomatoes! We heat and irrigate our greenhouses using a closed loop system, meaning that the system is fully automated to regulate temperatures, etc. on its own. Fun Fact: our Virginia Farm hot water tank has a 158,503-gallon capacity. The average American uses 20 gallons of water per shower – which means we could supply enough hot water for 7,925 showers. In addition to reusing a renewable resource like water, our high-tech greenhouse structures and strict protocols virtually eliminate the need to use pesticides; instead we use what we call IPM (Integrated Pest Management) wherever possible. If we find a harmful insect in the greenhouse we introduce good bugs in our greenhouse that protect our plants and eliminates the threat of harmful bugs. Our high-tech greenhouses also naturally pollinate with the use of bumblebees. Using bumble bees increases crop yield, improve quality and reduce labor. Read more on natural pollination in the Greenhouse Grower. Flavor profile, use of less resources, availability of produce all year round, and less chance of pest damage and pesticides all seem like pretty incredible benefits of greenhouse grown to us. How about you? 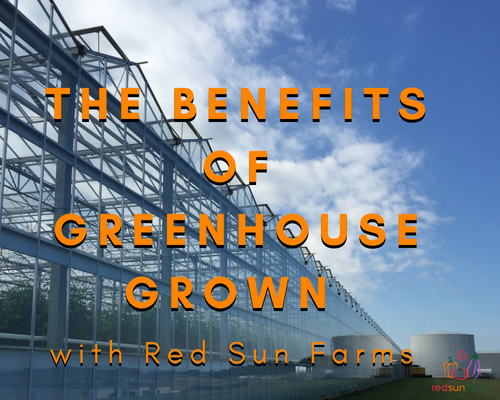 If you have any questions about greenhouse grown produce and its benefits, feel free to email marketing@redsunfarms.com. We are always looking for new ways to improve our greenhouse efficiencies, follow us on Facebook and Instagram this summer for a look behind the scenes at some of our greenhouse production.